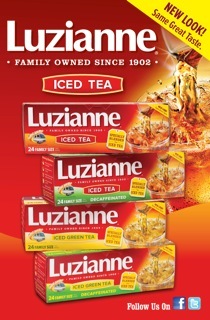 Welcome to a special MMMmonday - featuring Luzianne Tea as part of National Iced Tea Month. In the South, Luzianne is synonymous with Sweet tea and I had the chance to try out Luzianne's Green Iced Tea and WOW! it makes great iced tea! The green tea bags smell great as you open the package - and I love that Luzianne is designed specifically for iced tea - I've tried making iced tea with my hot tea bags and there's just something missing - especially in the South where I've found people take their tea very seriously. I was very impressed with the smooth taste of the iced green tea and also the rich color that came from the Luzianne tea bags! Combine tea bags, water, mint and sugar in pitcher. Cover and steep for 20 minutes. Remove and discard tea bags and mint leaves. Chill and serve over ice. Makes 2 quarts. I also love it with some fresh orange and ginger - I just chop the ginger (about 1/2 a finger sized piece) and slice the orange and add it while you are steeping the tea and discard the ginger and orange before serving. How do you drink your Luzianne tea? Do you make it sweet, add a twist? You can keep up to date with Luzianne tea on their website http://www.speciallyblended.com/, on twitter and on Facebook! And while you're on their website you can enter to win their Specially Blended sweepstakes and if you're in Texas, there are still dates left in their Specially Blended Tour!